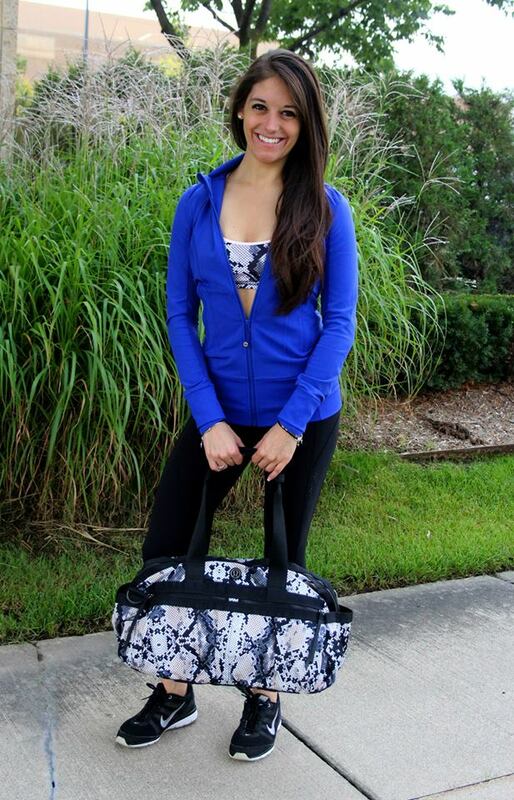 The new Daily Practice Jacket in Sapphire, Lighten Up Bra, Beyond Boundaries Pant, and Gym to Win to Duffel. 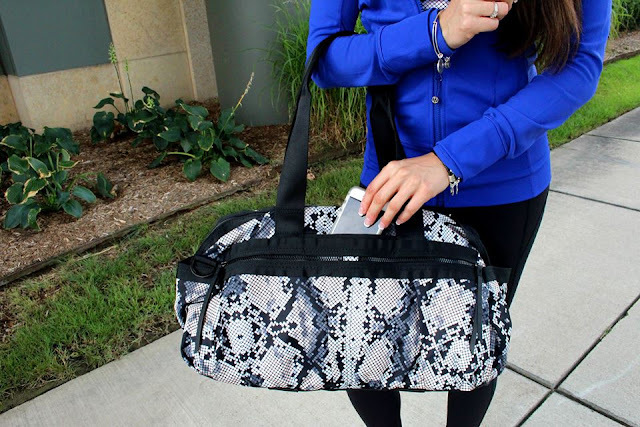 Seva Sweater, Jazzy Snake Hi Rise Wunder Under Pants, and Follow Your Bliss Bag. Sattva Pant and Sunset Salutation LS. This snake print still kills me, it doesn't matter the style it still looks cheap. Loving this blue though! Question: do you ladies still wear your dark coloured pants (this blue one, the cranberry one and so on) during fall/winter? I am in love with the cranberry pants but I don't wanna buy if it is more of a seasonal thing, because I can never get the "winter colour rule" I decided to ask. I say do whatever the heck you want! I like this version of the Lighten Up Bra but I also have an issue with the snakeskin. Too snakeskin boots reminder or something, it has a stigma. Maybe in a bra it's not such a big deal and I do genuinely think the bra looks cute and tasteful. I am not a fan of the Seva sweater and don't get why it's back. But I don't get half the stuff people walk around in these days. I didn't know there were still fashion rules regarding color. Lol! Not sure why cranberry wouldn't be a fall/winter color...it's a nice jewel-toned color that screams fall/winter more than summer to me anyway. The sapphire blue daily jacket practice jacket looks amazing on her. The stock photos online make the jacket look long and frumpy. I am only 5'2" and will definitely stick to my tts size 4, but not sure if it will look ridiculously long on me. Also waiting for the herringbone to come to the US. Has any petite person tried it on? 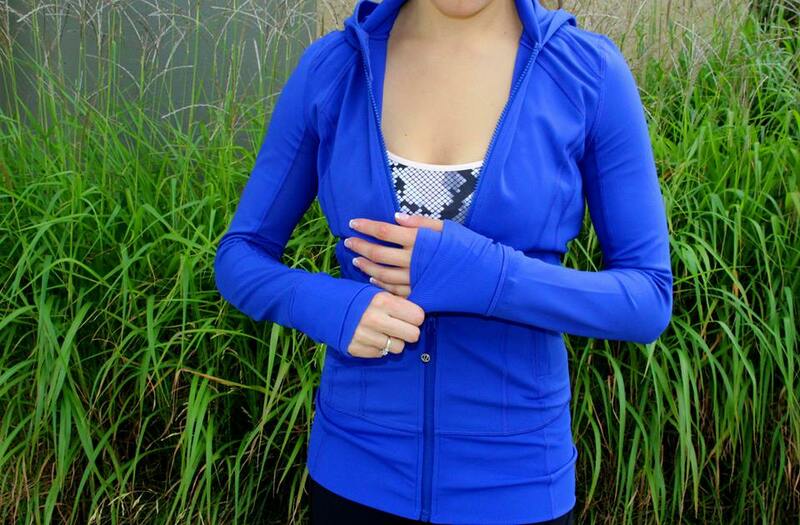 To settle my own curiosity, I held the sapphire daily practice jacket up to the pipe dream blue sweaty or not bra. The sapphire blue is a deeper, richer, more intense blue than pipe dream. Very pretty! @Anon 8/30 9:15 am - I have a petite 5'2'' frame that is currently a bit curvy (namely a baby bump) and got the sapphire daily practice jacket in my normal size. I don't know how lulu made it look so bad online other than the model should have sized down based on the size of her top half - so if you have tiny shoulders even for a petite frame maybe try a 2. I also didn't feel like the style was too long for me (I have a Nice Asana (?) jacket from 2 winters back that is too long and looks dumb on me so I think I know what you mean when you're worried about it!). Maybe the seams/styled bottom on the Daily Practice help the appearance as far as the length. I felt like the fit is comparable to a Stride Jacket, just a little updated with the styling and a less oppressive collar. Also the hood is a really nice size - covers your hair without covering your eyes as well :P anyway hope you try it and love it!! I think the herringbone would be lovely (my store didn't have it yet) but the blue is really nice in the meantime.